May of 2004 found me returning to the South American continent and to the country of Venezuela. This was a big project, but I didn't get to see much of the real field action. I was too busy seeing the sights. Alright, before you write your congressman, me and everyone else, really did have to work pretty hard during this project, but there was also a lot of traveling from one work center to the next. The real traveling and getting to do some sightseeing came after the project was finished. It is always fun to return to a place that you have been to before. You get to revisit familiar places, visit with folks you haven't seen in a while, you don't feel quite so lost, and you get to actually go to some of the places that you said you would leave until next time. 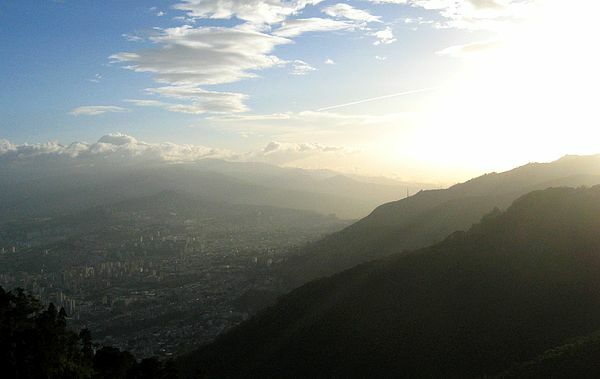 Below is a view of the western part of Caracas from one of the passenger cabins of the ?vila Cable Car tramway near the top of the Cordillera de la Costa mountains. A crew of four from PASSCAL was already in Venezuela and the experiment was about 1/3 finished when Pnina, below, and I flew down to relieve a couple of them. This was Pnina's first PASSCAL experiment and she was pretty excited. Can't you tell? 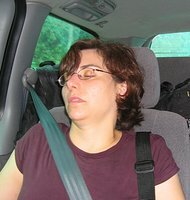 I don't sleep much on experiments, and having a picture taken of of you like the one below would be a good example of why. The trip started out kind of nice. We spent the first couple of nights at the Best Western Puerto Viejo Airport Inn in Catia La Mar which is just up the coast from the airport. That's the Caribbean Sea in the picture below. 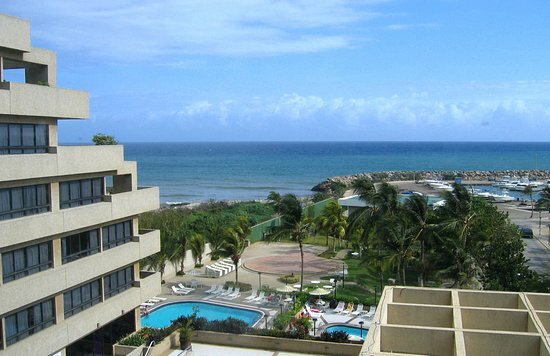 Below is the marina adjacent to the hotel's grounds. This portion of the beach looked pretty nice, but about one foot past the high chain link fence that surrounded the area things got ugly pretty quickly. Such is life just about everywhere. 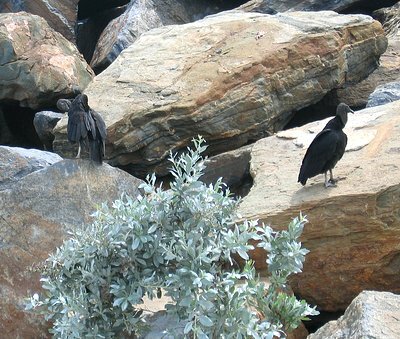 The vultures at the marina apparently knew what was to come and were waiting patiently for our return. This experiment was orchestrated by Alan Levander, Colin Zelt, and the usual suspects from Rice University in Houston, Texas. These were the same folks I worked with in my first PASSCAL experiment in 2000. The whole show was actually much larger than met the eye. On the map below about 800 Refraction Technology 125 "Texan" recording instruments were deployed along the land portions of the four mostly north-south black lines. 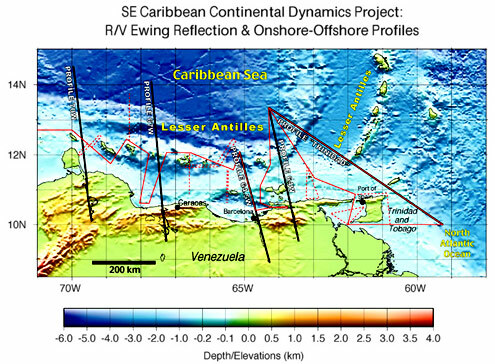 About a dozen other recorders were placed on the various islands off the coast of Venezuela. A a 230 foot research vessel, the Ewing, made its way along the red squiggly lines setting off air "explosions" in the water about every 20 seconds. The shock waves from those "explosions" (I keep saying"explosion" because the noise was not created with something like dynamite, but rather just with compressed air) would travel down through the water, to the bottom of the sea, through the ground and bounce back up to the sensors and recorders on the land. This way a "map" of what was going on at in the area of the earth where the South American and Caribbean tectonic plates joined could be made. A better understanding of this area, and any place where the the tectonic plates collide, was the purpose of this experiment. 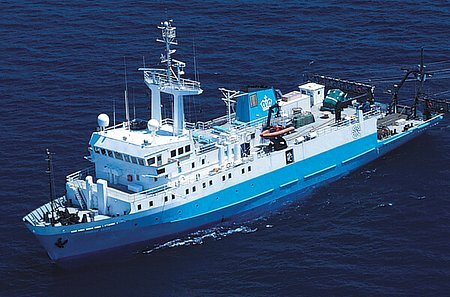 Below is the R/V Maurice Ewing which is operated by the Lamont-Doherty Earth Observatory. The experiment had to be delayed a couple of months because of mating whales in the area, but eventually the whales moved on and permission was given for the experiment to start. The whole process of moving to an area, deploying the Texans, recording for a few days, picking up the instruments, downloading, moving the instruments out on the islands, and repeating three more times as well as keeping everything coordinated took about a month. The act of actually taking the Texans out and planting them in the ground is known as a deployment. Prior to each deployment all of the deployers were gathered together for a briefing. 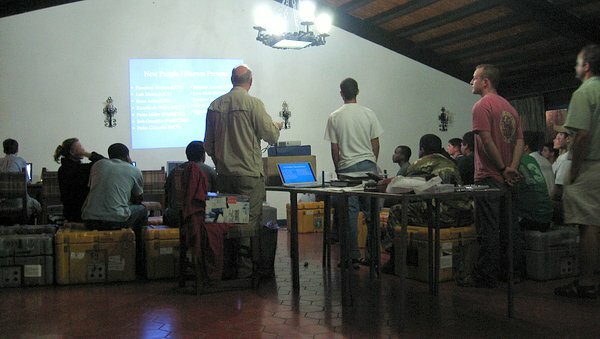 General road and weather conditions, safety, safety, safety items, who was going where and with whom, what to do if you got stuck somewhere, how the experiment was going so far, and making fun of the mistakes of other deployers were some of the topics covered during these meetings.